Learn more about Colombia and other countries in our daily postcard e-letter. Simply enter your email address below and we'll send you a FREE REPORT: Beautiful, Diverse and Safe - Take Another Look at Colombia. Retiring to Colombia is all about being able to make choices that suit your lifestyle, budget, and interests. This country of 48 million people touches both the Pacific Ocean and the Caribbean Sea, has the three ranges of the Andes Mountains running through its center and has 10% of the Amazon rainforest within its borders. 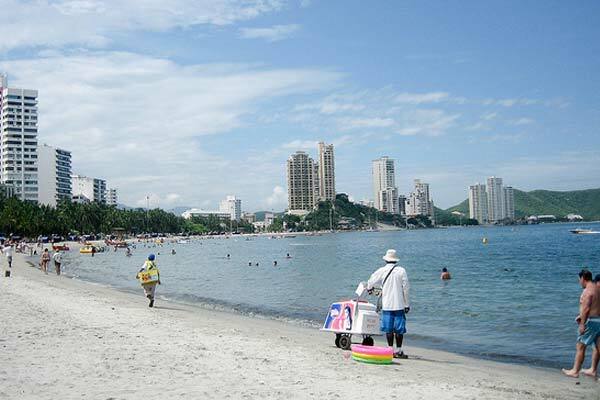 With expat-favorite countries of Panama as its neighbor to the west, and Ecuador to the south, it was just a matter of time before Colombia started to be recognized as the next great place to retire. As the second most bio-diverse country in the world, you can choose whichever climate and environment suits your taste. Colombia has everything from warm, tropical ocean-side communities, to spring-like cities and towns in the upper hills, to cooler mountain locations. According to the Colombian Department of Immigration, the influx of tourists from the U.S. to Colombia has grown over the years to 445,000 visitors in 2015. Colombia is moving up the list of must-go places to visit. And more and more of those visitors are discovering the benefits of retiring in Colombia. With Latin America’s third largest economy, a stable government and banking system, world-class healthcare, a lower cost of living, and many first-world cities, expat retirees can find everything they need for a comfortable life. Living in Colombia for more than 180 days in a calendar year will require a visa. While there are 19 different visa categories, the most common one for expat retirees is a TP-7 or pensionado visa. You must prove a minimum monthly income of a $700 from Social Security, or a qualified pension or retirement account. In the case of a couple, one spouse applies for the visa and the other is covered as a dependent. Access to affordable and quality health and dental care is excellent. Colombia has an extensive network of modern public and private healthcare institutions. América Economía, Latin America’s premier financial publication, ranked 22 Colombian hospitals in its top 50 in all of Latin America. Four of those hospitals have been awarded Joint Commission International accreditation, the gold standard in world healthcare. What Does it Cost to Retire in Colombia? The answer of course depends on where you choose to live and the lifestyle you desire. Many expats find that they live a higher quality of life than they did back in the U.S., some with amenities such as regular maid and handyman services, which they never could have afforded back home. A monthly budget between $1,700 and $2,200 is enough to live comfortably, especially if you have purchased your home. Renting or purchasing real estate in the smaller cities and towns is less expensive than in the larger cities and on the coast. There are reasonable rents available between $300 and $700 per month for two bedroom apartments. And if you want the luxury, penthouse apartment, or that large home in the country, you can find those for a fraction of the price in the U.S.
One constant throughout Colombia is the abundance of fresh, inexpensive produce and local meats and poultry. Whether you shop in the supermarket chains, the local store, or at farmers’ markets, you will find prices between 50% to 60% of what you’d pay in the U.S.
You can lead a rich, fulfilling, and interesting life in Colombia, where you get to do more of what you want to do, and less of what you don’t. Be as active or laidback as you desire, and enjoy a high standard of living at a cost well below what you pay now. Colombia is probably one of the most misunderstood countries in the world. People of my generation have had very little exposure to this country. We remember the Juan Valdez coffee commercials, and of course, the news stories of Pablo Escobar and the drug cartels. Pablo died in 1993 and the shadow that he cast over the country has been lifted to reveal the new Colombia. A country with warm, welcoming people, stunning scenery, and the fourth largest economy in South America. There are so many things to consider when it comes to deciding where to retire. Everyone has their own checklist of most important things to think about. This is my pick for the five best reasons to retire to Colombia. We all want to have good health and not think about being sick. But let´s face it, as we reach retirement age, access to quality, affordable healthcare services becomes a front-and-center issue. You will be pleased to know, and maybe even a little surprised, that the World Health Organization (WHO) ranks Colombia number 22 for healthcare system quality out of the 191 countries that they review. That surpasses Canada which ranks number 30, and the U.S. which comes in at number 37. Twenty of the top 49 Latin American hospitals are in Colombia, including four that have received Joint Commission International Accreditation, the gold standard in hospital care. Private, public, and teaching hospitals as well as smaller clinics offer general and specialty inpatient and outpatient services throughout the country. Colombia has a national public health plan, EPS (Entidades Promotoras de Salud), which is available to any expat, regardless of age, who has a resident cédula (national ID card). These premiums are equal to 12% of the retiree´s reported pension income. Most retiree´s premiums average $75 per month. You can supplement this basic plan by purchasing one of several private health insurance plans at a fraction of the cost in the U.S. These private policies have age and pre-existing coverage limits that vary among carriers. In Colombia pharmacists are often the first place you go for simple problems like a bad cough or a urinary tract infection. They are trained to listen to your symptoms and make recommendations for treatment. You do not need a doctor´s prescription for many medications—they can be bought over-the-counter for very low cost. Retiring to a foreign country doesn´t necessarily mean that you have to move far away from family and friends. Colombia is located on the northern tip of South America. A slightly more than three-hour flight from Colombia´s major cities of Medellín, Bogotá, or Cartagena gets you to Florida. Within another three hours you are in Boston, New York, or Washington DC. When you think about it, it is approximately the same time it takes to fly coast to coast across the U.S.
And the travel doesn´t have to be just so that you can fly back to the U.S. Family and friends can easily make the trip to visit you and see first-hand all the wonderful reasons you chose Colombia. American Airlines, Jet Blue, Avianca, and Spirit Airlines all have regular service to Colombia. Colombia is the second most bio-diverse country in the world. It touches both the Caribbean Sea and the Pacific Ocean and has the three ranges of the Andes Mountains running through its interior. If you crave sand and waves, you can choose to live in the warm, tropical Caribbean coastal cities of Cartagena, Santa Marta, or Barranquilla. The crystal-clear water and white-sand beaches allow you to enjoy the humid 90-degree daytime temperature. But in the evening, sea breezes delightfully bring in cooler upper 70 temperatures, perfect for evening strolls through the town. If you prefer a more temperate climate, then head for the mountains. Medellín, Colombia´s second largest city with a population of 3 million, sits at 5,000 feet above sea level in the midst of the Andes. Known as the City of Eternal Spring, the average daytime temperature is in the mid-70s to low-80s, and dips into the mid-60s in the evening. Medellín sits in a valley and extends up the mountains to the east and the west of the low point. Much of the terrain is hilly, but a few neighborhoods are very flat and pedestrian friendly. Bucaramanga, in the eastern part of the country near the Venezuelan border, is about one-third the size of Medellín. It is on a mesa at 2,000 feet altitude and therefore has a slightly warmer climate, and is completely flat, making walking around the city easy. Lush, green coffee plantations are the backdrop for the cities of Pereira, Manizales, and Armenia. Known as the Coffee Triangle, this area is just slightly cooler than Medellín, especially in the evening. Sitting around an outdoor fire pit while drinking some of the best coffee in the world is a pretty great way to spend an evening. Because Colombia offers so many living and lifestyle options, you will be able to find an area to live that fits within any budget. Obviously oceanfront high-rise condos, sprawling country homes, and penthouse duplexes will be more expensive than more modest-sized apartments located in medium-sized cities and towns, with rural locations being even more affordable. However, you will most assuredly live a higher quality of life at a lower cost than you had back home. In the town of Sabaneta, just outside of Medellín, I bought my three-bedroom, two-bathroom apartment in a two-year old building with a swimming pool, gym, covered parking, and 24-hour security for only $86,000. Everything from fresh fruits and vegetables, grass-fed beef, and freshly-caught fish are both inexpensive and plentiful. Bring home a week´s worth of fresh produce for $10. The low cost of local food makes living within a $2,000 monthly budget certainly do-able. The cost of utilities is very reasonable. An average monthly bill for gas, electricity, and water and sewer is about $70. Add to that another $60 per month for home phone, cable TV, and high-speed internet and you are still way below what utilities cost back home. Colombia is a perfect retirement haven for those who like to discover things for themselves and not follow the beaten path. The days of Colombia´s dark past are gone and the country has been transformed into a thriving, welcoming place. The New York Times has chosen Colombia as number two of 52 countries to visit in 2018. Tourism has been growing over the past several years. Just last year tourism jumped by 24%. With attention like this, expats and retirees are beginning to discover all that Colombia has to offer. Get in on the ground floor and find the part of the country that fits your needs. You won´t exactly be a pioneer, as there are expats living in Colombia now, but you will be coming before the crowds discover it.